Today is the day we celebrate love. For me, it is the day I celebrate the love I have for my husband and my children. And ... this day brings another special meaning into my life. It is the day my grandmother was born. Way back in 1931, she blessed this planet with her birth. She is my second mother. She and I are in essence the same person. Today we are off to celebrate her life ... to celebrate her 78th birthday. And there is no other way I'd rather spend this day. 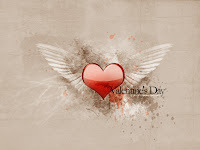 Enjoy your loves today everyone ... and Happy Valentine's Day! Awwww, sweet! I like your graphic too. Bethany, will you email me? There is a Canon Rebel listed locally on Craigslist. I want to know if that is what you recommend or if there is another option I should go with. I know nothing about photography but I want to start learning.